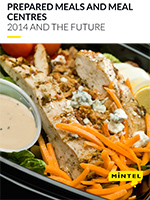 This global annual market overview will provide you with an in-depth review of the key issues in the global prepared meals and meal centres market through 2014 as well as our forecast for what will happen in 2015 and beyond. Demand for convenience foods, expansion of modern food processing and retailing, rising incomes and fast-paced modern lifestyles continued to drive growth in the prepared meals category in 2014, led by China, the US and the UK. While Japan retains its position as the fifth largest prepared meals market globally, the market is growing slowly. Some of the highest value CAGRs have been enjoyed by Asia’s developing markets such as Vietnam, Thailand, Indonesia and Malaysia, with high projected growth on very small bases of current business. South Korea is the notable exception to this as it already has a sizable market base, and has also experienced strong growth. Convenience continues to drive demand for prepared meals around the globe, and this can be expected to continue. However, consumers are also demanding healthier and more natural prepared meals, and this is being reflected in the rise in no additives/no preservatives claims, as well as other health-related, ethical and premium attributes that are driving category innovation.